Here are two photos from last year, one at planting time (yes, they look dead and horrible! ), and one just weeks later, as the kids admired them with me. Planting them sideways is one of the ways these tomato behemoths not only survived, but flourished. My tomato seedlings always grow into tall trees before it's time to get them into the ground. I wouldn't exactly say they are leggy as much as lanky; I affectionately call them my awkward teenage tomatoes that need some space to grow. To give these oversized babies some extra support, I have learned to plant them sideways! You can bury tomato plants all the way up to the top leaves for a super-strong, deeply rooted plant. However, my raised beds along the side of my house (under which is gravel), don't allow that option. 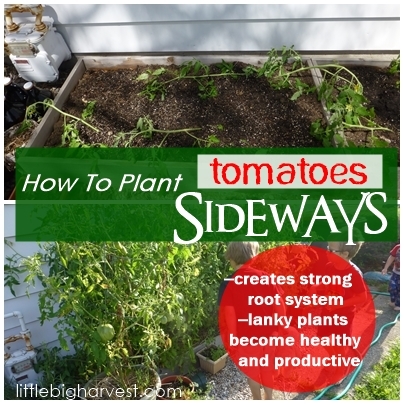 Sideways planting is a really good alternative and helps grow a healthy tomato plant with strong rooted anchors. 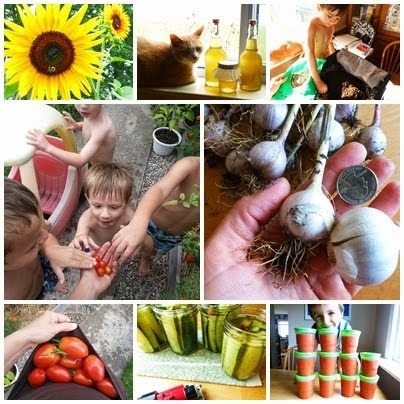 This post was featured at the Home Acre Blog Hop! Great job with the video! :) I love amish paste tomatoes too! Thank you, Megan! It felt so awkward making the video, but I had fun! I never even knew that you could plant tomatoes sideways... the video came out so great, thanks for all the helpful tips! What zone do you garden from? I always get so nervous about my plants when I compare them to other zones. My plants (started from indoor seeds) seem so small! So, I have come to discover more ways of planting tomatoes. Great effort. Growing tomato plant sideways showing great results. I would also give it a try in my garden bed. Tomato contains some important nutrients like Vitamins A and C and lycopene.